It's that time of the month again! Wait, no, that sounded weird. This has nothing to do with menstrual cycles. IT'S PRINT CLUB TIME, PEOPLE. Geesh. Stop being gross. Cast your vote in the comments below for the print you'd like to receive FOR FREE in August. The theme is gardening. My favorite theme! Join today to get free downloadable art delivered to your inbox every single month. *All images copyrighted and cannot be used for resale. Thank you! The winner will be delivered on August 1st. Check your email for July's free print! Print Club Members- time to cast your vote! Yay! It's Friday! Usually every day is pretty much the same for me, but for some reason this has been the longest, most exhausting week. I'm READY for the weekend. How about you??? Ok, so let's do something F.U.N. today! Want to vote on next month's free print? Yes! You do! 4. Mystery print entitled "When the house plants took over." 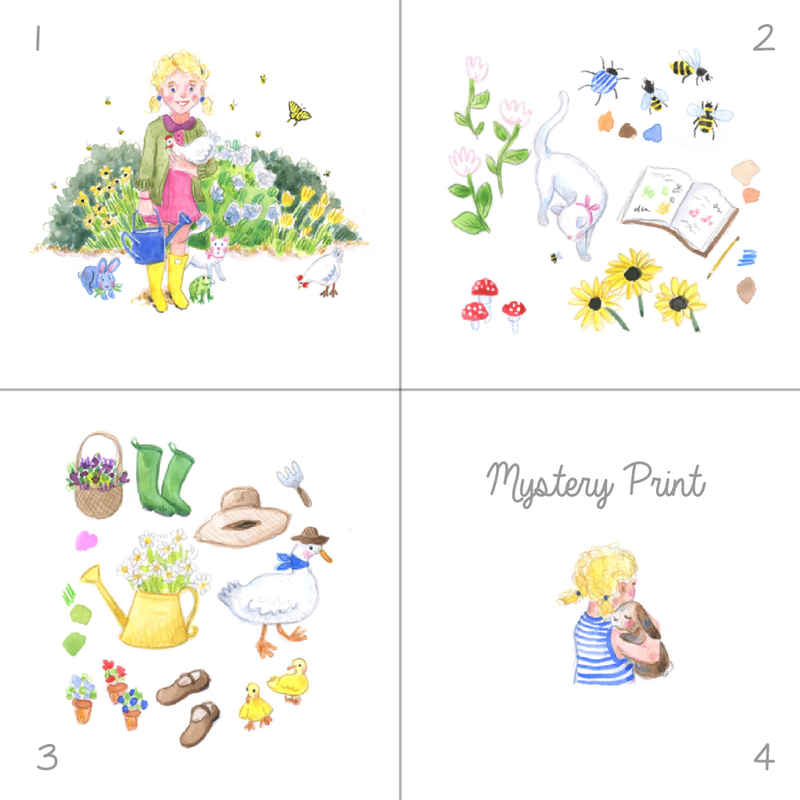 These are all illustrations I've created for my children's illustration portfolio (see more here) with the last "mystery print" being a work in progress. I actually started the illustration a few weeks ago and realized it wasn't going in the direction I wanted it to go. So, I set it aside for a few days and am going to start a fresh one from a sketch I did in that moment of frustration when I realized that first painting just wasn't working out. It's up to YOU which print I'll giveaway next month, so leave your comment below or on Instagram or Facebook. If you aren't already signed up for my Print Club, you can do so below. It's totally free to join! Get a FREE downloadable print in your inbox every single month. *All images are copyrighted by Michelle Schneider and cannot be used for resale.